In the first full year after conversion our gas usage was 65% lower than the 8-year average before conversion. The ULTRA windows and doors are good quality and very substantial. They look good and everyone who sees them compliments us on them. The tilt and turn mechanism for the windows works well and is easy to use. They are streets ahead of other windows and doors on the market. We chose Green Building Store for the MVHR system because it has a very good reputation for designing MVHR systems. We knew we would get a well-designed and efficient system. It may have cost a bit more than others on the market but we knew we would get a high-quality system. The system is very quiet – we don’t hear it at all around the house except faintly at night when the house is quiet. Having cleaner, filtered air is very important for us as the house is next door to a PVC flooring factory and close to a main road. We use a pollen filter on the incoming air stream to remove as much solid matter as possible from the air. 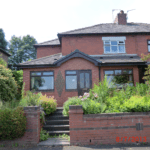 In 2007 John and Pauline Grayson bought a 1930s 3-bed, ex-council house in Manchester in need of serious work, but with good potential for an energy-efficient conversion and refurbishment. 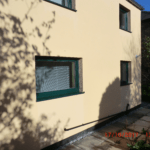 In 2017 the house received EnerPHit certification (the version of Passivhaus for refurbishments) from Mead Consulting. This was after many years of research and mistakes, some of them expensive. The Graysons made the retrofit work a climate change project and specified it in some detail. The conversion was designed by Andrew Yeats at Ecoarc Architects Limited. Alan Clarke, the project M&E and PHPP consultant, undertook the ventilation, electrical and plumbing layout designs. 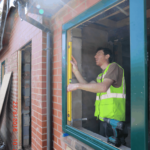 Green Building Store designed the detailed specification of MVHR heat recovery ventilation system and supplied the ULTRA triple glazed timber windows and entrance doors for the project plus airtightness sealing tapes. As part of other home improvements. “The house needed a new roof, new windows, re-wiring and re-plastering amongst other things, so we undertook our radical retrofit at the same time. Essentially the house was gutted inside and we moved out for 10 months”. 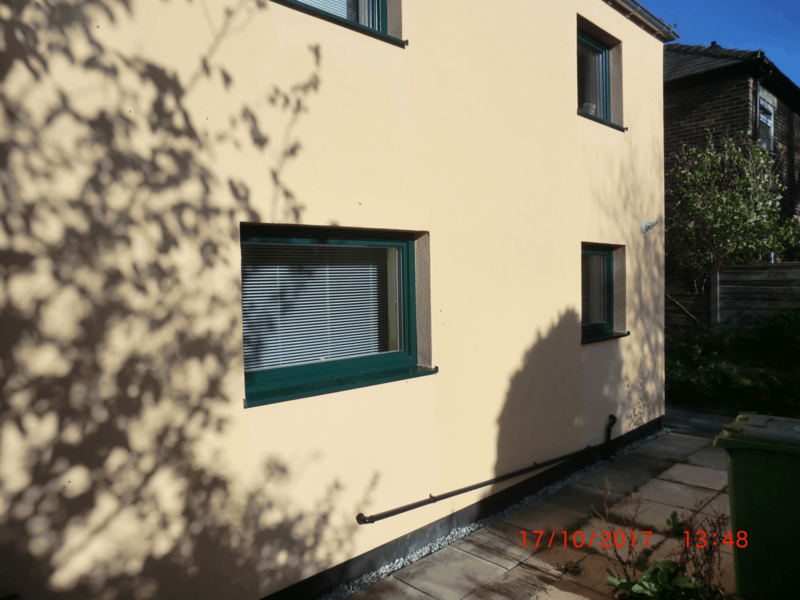 The EnerPHit radical retrofit involved the use of 150mm graphited EPS external wall insulation going down to the foundations, as well as insulation of the 50mm cavities in the external walls. Also, the party wall received a combined acoustic and thermal insulation treatment. 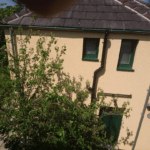 John commented: “Our builders did a great job and had great expertise in airtightness. Green Building Store Directors Chris Herring and Bill Butcher also came to visit us early on when we were researching the project and helped steer us in the right direction on a few aspects, including the insulation and airtightness strategy for the ground floor”. The Graysons have made the technical details of the project available to others considering undertaking a radical retrofit. They already share their experiences with fellow Carbon Coop members in Manchester by holding open days. 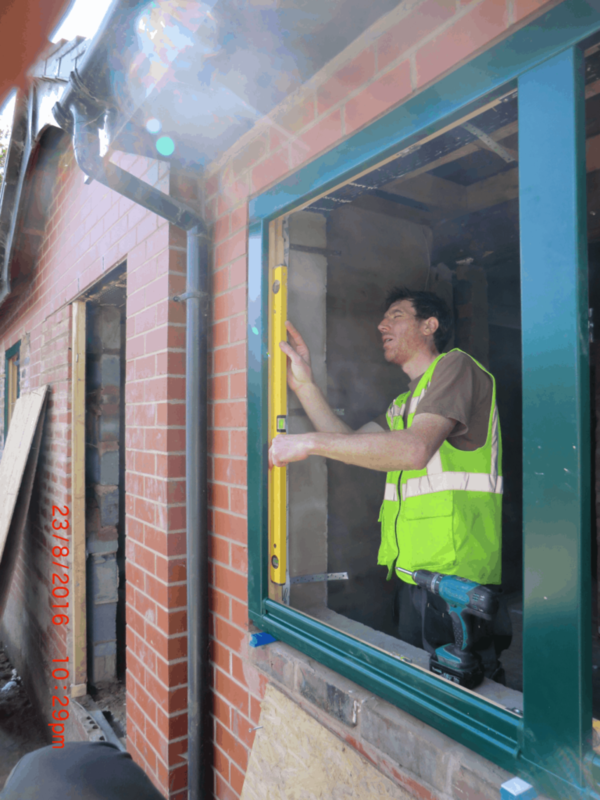 Green Building Store’s ULTRA triple glazed timber windows and doors (Moss green: RAL colour 6005) were specified for the project. 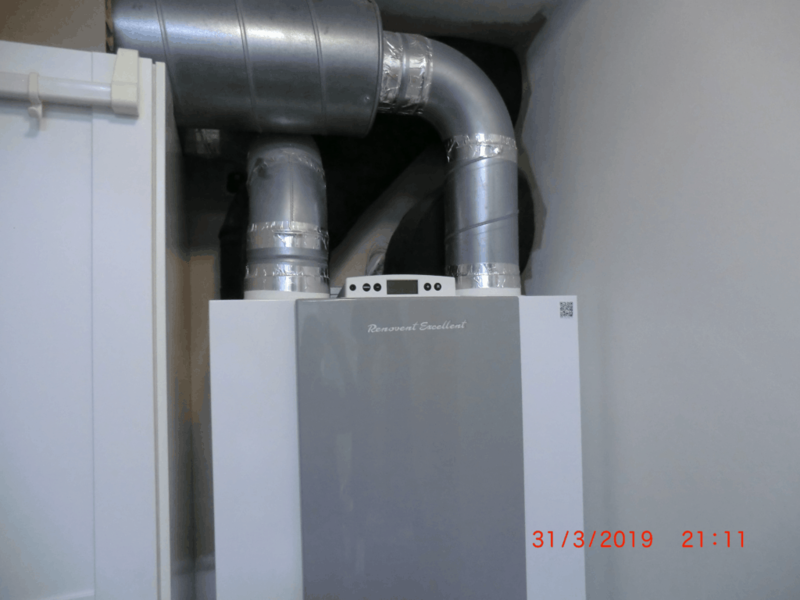 The project has a BRINK Renovent Excellent MVHR system specified by the Graysons and designed by Alan Clarke, with detailed specification and supply by Green Building Store. The system was installed by the builders on the project. “We chose Green Building Store for the MVHR system because it has a very good reputation for designing MVHR systems. We knew we would get a well-designed and efficient system. It may have cost a bit more than others on the market but we knew we would get a high-quality system. 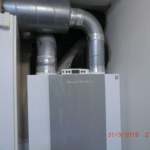 The Brink unit was chosen over other options because it was smaller and fitted the utility room better. The system is very quiet – we don’t hear it at all around the house except faintly at night when the house is quiet. 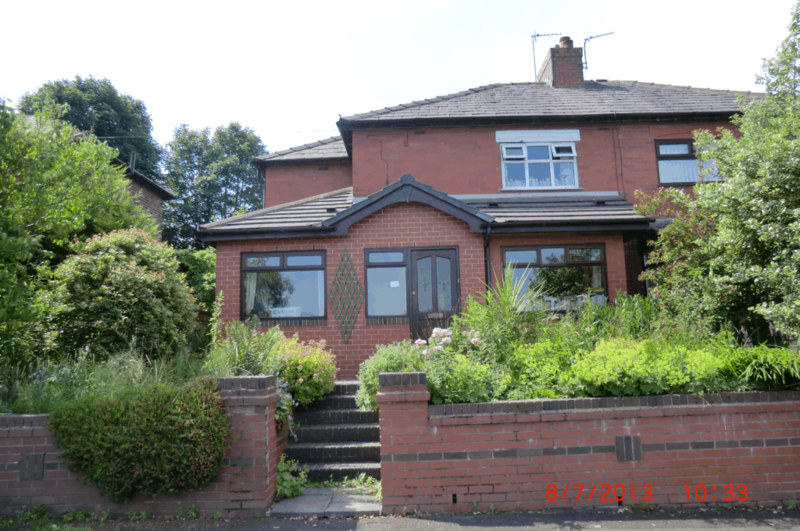 “We have now been back in the house for nearly two years. 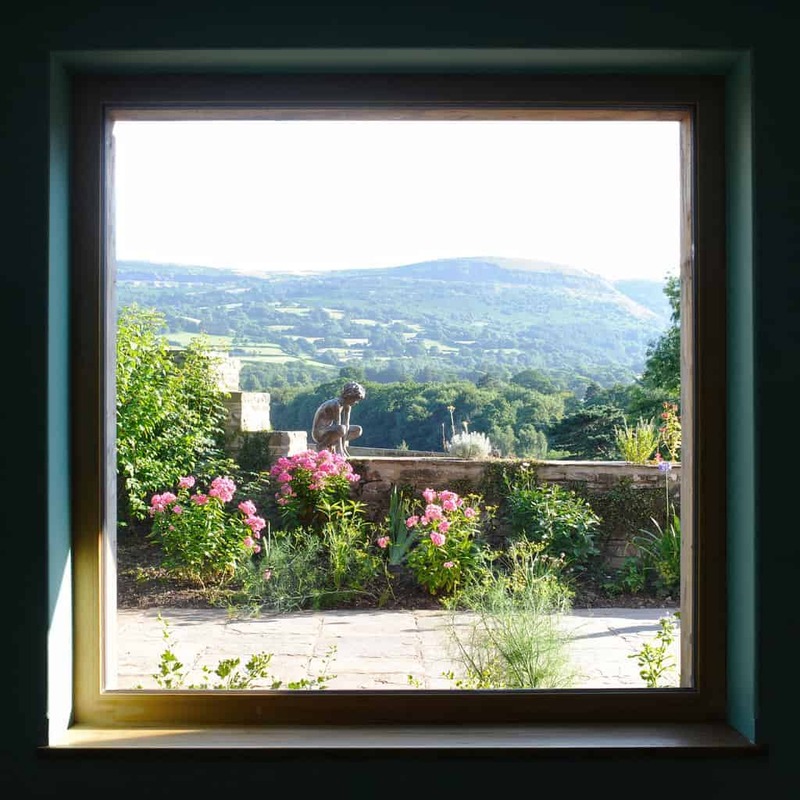 Although it used to be a cool house, we don’t need to heat it during the summer months: we set the thermostat to 17.5°C and open the upstairs windows at night to cool the house in hot weather. During the winter we set the thermostat to 18.5°C in the early evening to achieve a cool bedroom for sleeping; and to 20°C in the morning to feel comfortable. The temperatures are very stable in all the rooms. “We are not complacent about what we have done. We are aware that Britain needs to end its reliance on fossil fuels to heat buildings by 2030 (as per the UN Special Report 1.5 in October 2018) as just one part of tackling climate change. This part alone is a huge task and will need a state-funded mass refurbishment programme as well as individual lifestyle changes. The reason that the main political parties have betrayed the population is not directly because of Brexit itself; it is because they have wasted three years on Brexit when they should have been working out how to tackle climate change, and preserve all life on earth, as a matter of urgency. It will also involve a huge re-prioritisation of all our resources and a re-education exercise that would include treating houses and flats as homes and not just financial investments. Brexit and climate change are closely related in another way: the only way to unite the country after such a divisive three years is around the common main threat of climate change. 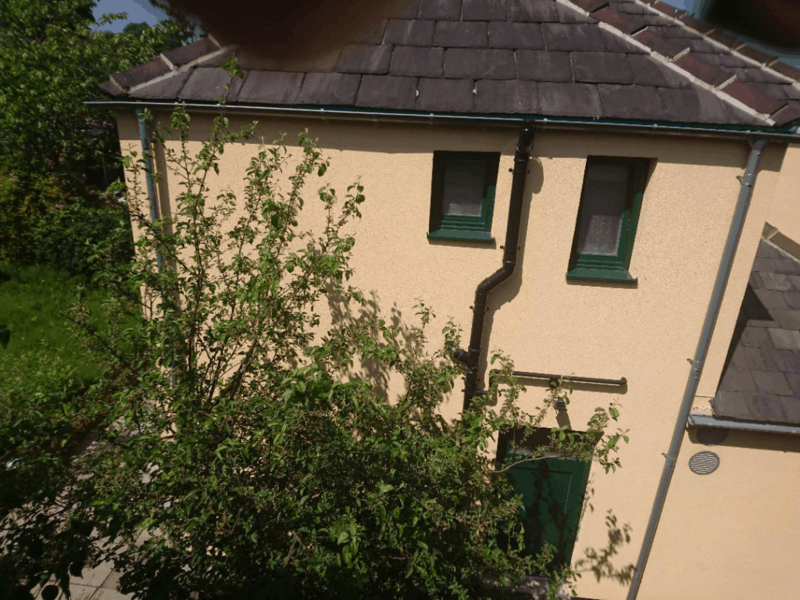 For our part we intend to install a PV array on the south roof, for which our consumer unit has spare capacity; and we already have a cable sealed into the loft to carry the electricity generated. We will heat our hot water with any spare electricity generated. We will also investigate the feasibility of installing a heat-pump. Both of these measures are mainly effective from spring to autumn. It needs new Government programmes to provide renewable energy for the winters”.